So, no posts in a while because I busted up my leg! 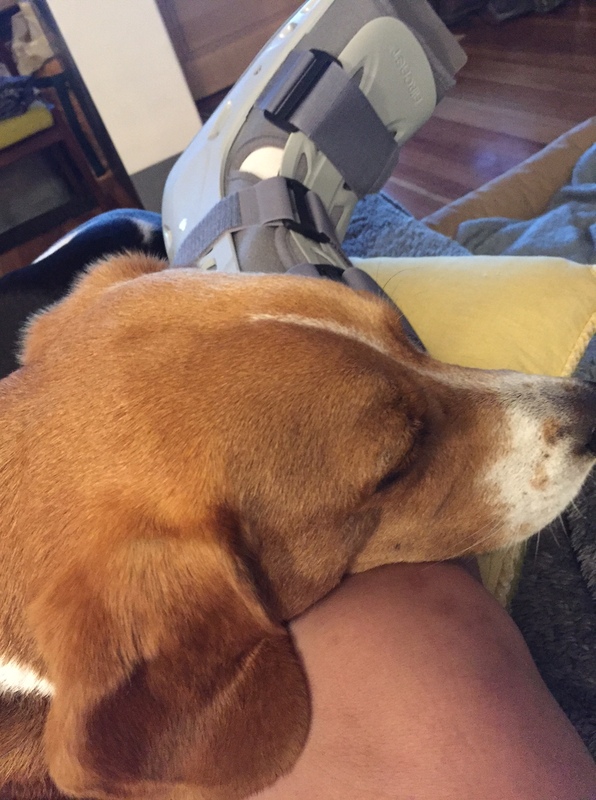 It’s on the mend, and far from a permanent injury, but I’ve been relegated to the couch for a month — a month!!! — and still have ~10 days with this walking cast/crutches situation. I have a very good leg guardian – Frankie won’t leave me alone. Or, he wonders why I don’t walk him! Many thanks to K for walking two dogs many times each day – a job we planned to share when adopting dog #2. Sorry ’bout that. I messed up my leg the evening that we had JUST finished all the framing for the garage. Argh! It was not an injury related to building at all – I just fell in the yard. Not even a steep part of the yard! 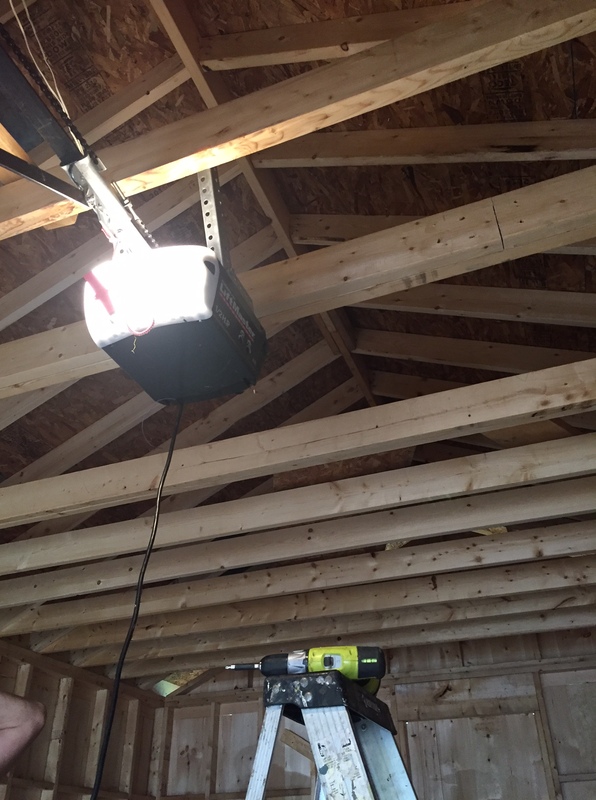 We were just getting to the fun part – roofing, siding, etc. – and suddenly I became completely not useful. After a week or so of K muddling about, he had some friends over who helped get past a couple of final framing bits and I decided to seek professional help since we really needed at least a roof on the thing. 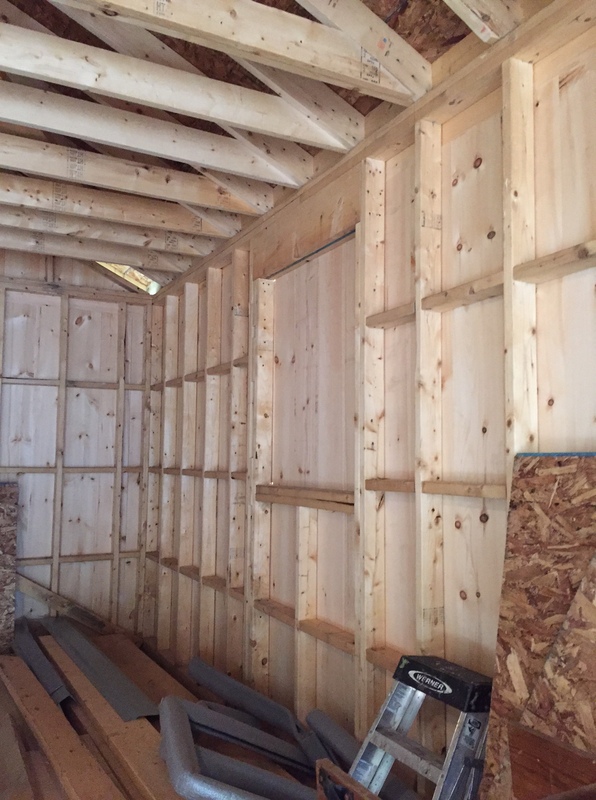 We found a new contractor who had just spun off from a larger, reputable company and he squeezed in a day and a half of labor to help K get the sheeting, tar paper, and roof installed. Wow – so much progress with three guys working all at once! View through my crutch on the porch. End of first day of work: half of metal roofing on! Nice side view of carport section. 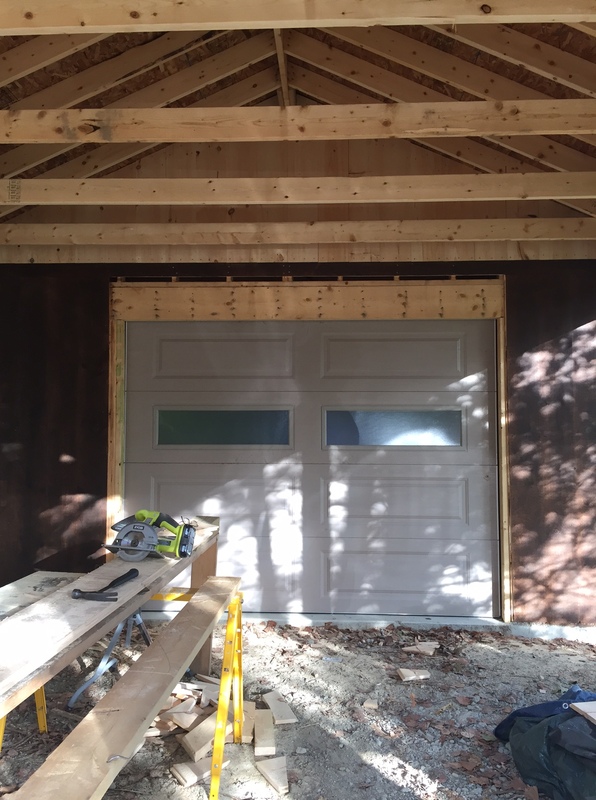 Finally, we decided to call in a garage door installer and he literally spent all of 1.5 hours installing the garage door. I’m pretty sure we would have spent a couple of very annoyed days installing and re-installing the thing, so this was a really good investment. Seriously, the videos showing how to install the door totaled a half hour, and this guy did the whole job flawlessly in an hour and a half! Besides, we bought the door used (but in pretty perfect shape) for about a quarter of the retail price. It’s fancy – even has an electric opener and a light!